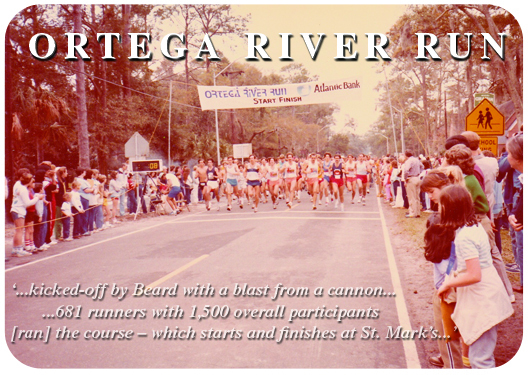 Race’s founders, early runners carry fond memories of the early days - The Resident Community News Group, Inc. | The Resident Community News Group, Inc.
Mike Wachholz’s starting line for the 1979 Ortega River Run was a little different than the rest of the field. It was only the second running of what has become one of Jacksonville’s longest consecutively held road races, so there may have still been some kinks to iron out (not to mention that road races in general were a relatively new thing back then for runners and organizers alike). Wachholz burst from the restroom in a panic and rushed through the crowd to try to catch up with the other 600 or so runners over the five-mile course. “It was like the parting of the seas. People moved out of the way to let me pass and I was running out of my mind trying to get to the front. It was actually very motivational, with people cheering me on,” recalled Wachholz, who was 22 at the time and lived near St. Mark’s Episcopal Day School, which has held the event since its inception. The crowd support propelled Wachholz to an impressive second place finish in 25 minutes, 50 seconds, behind winner George Burns’ 25:30. Many of those “older runners,” as well as the race’s original organizers from St. Mark’s, remain active today within both the school and running communities. Like Wachholz, their fond memories hold a few colorful mishaps and a high regard for the event, which celebrates its 35th anniversary on Feb. 23. Top among those organizers are Wirt Beard and Fred Miller, who, along with St. Mark’s Church Rector Barnum McCarty, Tom Donahoo, Sr., and Bill Ketchum, Sr., came up with the idea for the run and were pivotal to its early success. Also on board as technical advisors were Jay Birmingham, a pioneering ultra distance runner who currently coaches track at St. Johns County Day School, and John TenBroeck, a founder of the Jacksonville Track Club. “We began working about eight months before the event. We really didn’t know what it could be. We just thought it would be fun and we wanted to not lose money,” said Miller, an avid runner who not only served on the organizing committee but also ran in many of the races, including the first. a $4 entry fee (including T-shirt), tallied 681 runners with 1,500 overall participants, and profited $1,838.91 for scholarships. Mike Yarbrough won with a time of 26:33. The sponsor was Atlantic National Bank (sponsorship later changed to Daily’s). Rector McCarty said there was also a beer keg cracked opened in the school’s carport to celebrate the successful running, but it is unclear if that tradition has continued. 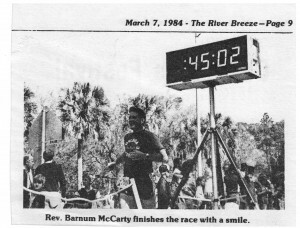 Adult beverages aside, the event has always featured a one-mile “novice” or “fun” run along with the five-mile race, and the course – which starts and finishes at St. Mark’s and winds through Ortega, crossing the Ortega River and Roosevelt Boulevard bridges – has remained virtually unchanged (with the exception of 2012, when bridge closures forced a new route. There was also the incident early on in the race’s history where a lead car mistakenly took a wrong turn, greatly reducing the course distance for the runners who followed. The only ones who count that as a true course change, however, are those who showed marked improvements in their personal record as a result). Gate (15K; 9.3 miles) began just seven months before Ortega, in March 1978, making Ortega the fourth oldest race in town behind Gate and the Summer (1964) and Winter (1975) Beach Runs, according to Alred. “Ortega started as a small race, but once it was moved into the Gate timeframe, after its second or third running, it grew in size. They realized the power of that date one year when they forgot to submit permits and ran it in May instead. The number fell to 500,” Alred noted. Despite that permit oversight, attention to detail has long been a trademark of the race. That included creative ways to ensure that the Ortega River Bridge did not go up during its running. “That first race we had someone standing next to the bridge tender with $20 at the ready to encourage him not to raise it,” joked Beard. Birmingham, who coached at Episcopal High School at the time, remembers one of his student’s fathers arriving one year with a dump truck that he was prepared to park in the middle of the bridge to prevent a rising. Regardless of these best-laid plans, the bridge did go up during one of the earlier runs, adding about five minutes to everyone’s finishing time. Beard noted that the original course went around Ortega Point first, and then crossed the bridge. “After that, we changed it so that we cross the bridge as soon as possible.” Now, permits ensure an uninterrupted crossing. There have been other changes in the race over the years in terms of technology, style, and the scope of the event itself, which has long expanded to include a huge street fair with food and games. Unchanged has remained the enthusiasm and appreciation for the race. Ortega, which is marked as one of the city’s best road races by its inclusion in the Jacksonville Grand Prix series, now typically attracts over 1,500 runners and even more participants, and this year will raise over $65,000 in scholarship donations. Routinely found among those participants are the founding organizers and runners, as well as their children, grandchildren and students who have added over the years to Ortega River Run’s growing legacy by their own participation in the race.